Description: Built in 1907 Southern 401 is undergoing a major rebuild. 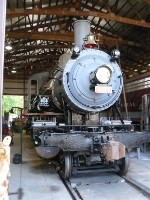 The Monticello Rail Museum hopes to fire it up in late 2008 or early 2009. Description: Newly restored Southern Railway 2-8-0 #401 ready for her official debut at the Monticello Railway Museum. Description: In the Shops 2 hours before the dedication. Description: Heading to the dedication. Description: Southern 401 crosses the wooden bridge at Monticello. Description: 401 pulls through a crossing just south of the museum. Description: 401 pushes its train at Nelson's Crossing. Description: 401 begins to pull forward towards the shop to prepare for the night shots. Description: Southern 401 participates in a night photo shoot in Monticello. Description: 401 and NS F9 4270 pose side by side. Description: Almost ready for its unveiling! Description: Pulling up for people to get photos. Description: This unit is a beauty. Congratulations Monticello, job well done! Description: Newly restored Southern Railway 2-8-0 #401 pulling a train during her debut weekend at the Monticello Railway Museum. Description: Night photo session with newly restored Southern Railway 2-8-0 #401 at the Monticello Railway Museum. Description: Newly restored Southern Railway 2-8-0 #401 backs up for a night photo session at the Monticello Railway Museum.